This app is brought to you by Mammoth Graphics a company responsible for delivering high class graphics for the likes of the BBC, ITV and Channel 4. This is the perfect study guide for students studying the text at KS3 and KS4. 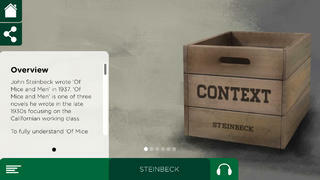 The detail in the app from the characters to the book locations to the history of Steinbeck and the USA is excellent. 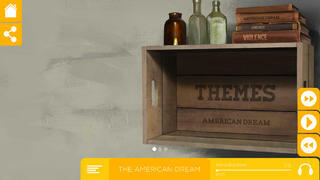 This app will certainly help you understand this great story and is an essential guide for students. 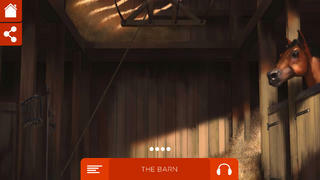 We love the graphics, the audio and attention to detail. 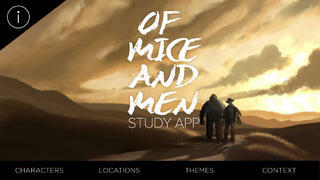 Study and explore the classic story 'Of Mice and Men' like never before. 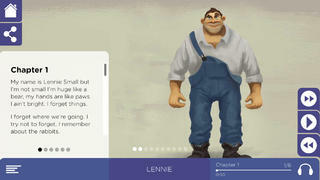 Combining a classic text, stunning artwork, and brilliant analyses into one app, this interactive study guide will help every student immerse themselves into the world of George and Lennie in 1930s America. Improve literary understanding and exam grades by availing yourself of an in-depth knowledge of Steinbeck's popular text. Boasting exceptional illustration and comprehensive study of the characters, locations, themes and context by an Oxford PhD English teacher, the App Store has never seen a study guide like this before.